There are thousands of pyramids across the planet. Some of the most impressive in Mexico, Bosnia, Egypt, Peru, Indonesia, Italy, Sudan, India, Japan and China- to name a few. The pyramids are connected with the stars, encoded with precise astronomical and astrological data, that we are just now learning about the details by many researchers. There is much controversy over the true ages of many of these megalithic structures and make us rethink just what we may know about our human history. They are perfectly precise and in alignment with each other by means of the sacred geometry and with the Ley Lines of the Earth. There are many more ancient sites across the planet which seem to form a pattern. It has been determined that there is a 25,000 mile long circle which goes directly through much of the most significant sites across the globe. What we thought we knew about these ancient structures is continually being modified through the work from many scholars, writers, historians, scientists, and those who challenge the status quo. The Great Pyramid is the most remarkable building in existence on the face of our planet today. It was built with such precision that our current technology cannot replicate it. This pyramid is so precisely constructed that until recently (with laser measuring equipment) scientists were not able to discover some of its subtle symmetries (not to mention duplicate them). Among other aspects, there are also very exact geometric relationships between all the structures in the pyramid complex at Giza. It is facts such as these that should raise questions about the commonly accepted (and mostly mistaken) interpretations of its purpose, history and construction, as well as the history of our society (and especially the so-called ‘pre-history’ of mankind). There are many answers out there, all you have to do is look. It is estimated that the pyramid has about 2,300,000 stone blocks weighing from 2-30 Tons each with some weighing as much as 70 tons. (see Socrates T. and computer model of new calculations of this figure. Two types of limestone was used for construction. A soft limestone either pure or nummulitic made for the bulk of the core blocks and a hard white limestone for the mantle. Hard limestone becomes more polished with age. The base of the pyramid covers 55,000 m2 (592,000 ft 2) with each side greater than 20,000 m2 (218,000 ft 2) in area. The outer mantle is composed of 144,000 casing stones, all highly polished and flat to an accuracy of 1/100th of an inch, about 100 inches thick and weighing about 15 tons each. The mortar used is of an unknown origin. On analysis, its chemical composition is known but it cannot be reproduced. It is stronger than the stone and still holding up today. Aligned True North: The Great Pyramid is the most accurately aligned structure in existence and faces true north with only 3/60th of a degree of error. As the North Pole moves over time, the pyramid was exactly aligned to True North at one time in the past. Center of Land Mass: The Great Pyramid is aligned to the center of the land mass of the earth. The east/west parallel that crosses the most land and the north/south meridian that crosses the most land intersect in two places on the earth, one in the ocean and the other at the Great Pyramid. The relationship between Pi (p) and Phi (F) is encoded in the fundamental proportions of the Great Pyramid. The four faces of the pyramid are slightly concave, the only pyramid to exist in this way. The centers of the four sides indent with an extraordinary degree of precision forming the only 8 sided pyramid. The granite coffer in the “King’s Chamber” is too big to fit through the passages and so it either was placed during construction, or produced on site inside the chamber itself. 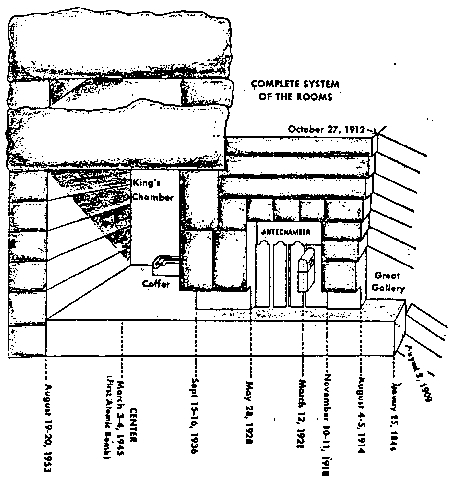 Microscopic analysis of the coffer reveals that it’s construction utilized a fixed point drill that used hard jewel bits and a drilling force of 2 tons. The coffer was possible quarried out of a block of solid granite. This would have required bronze saws 8-9 ft. long set with teeth of sapphires. Hollowing out of the interior would need tubular drills of the same material applied with a tremendous vertical force. Tools not found in the ancient Egyptians known tool set. The Great Pyramid had a swivel door entrance at one time. 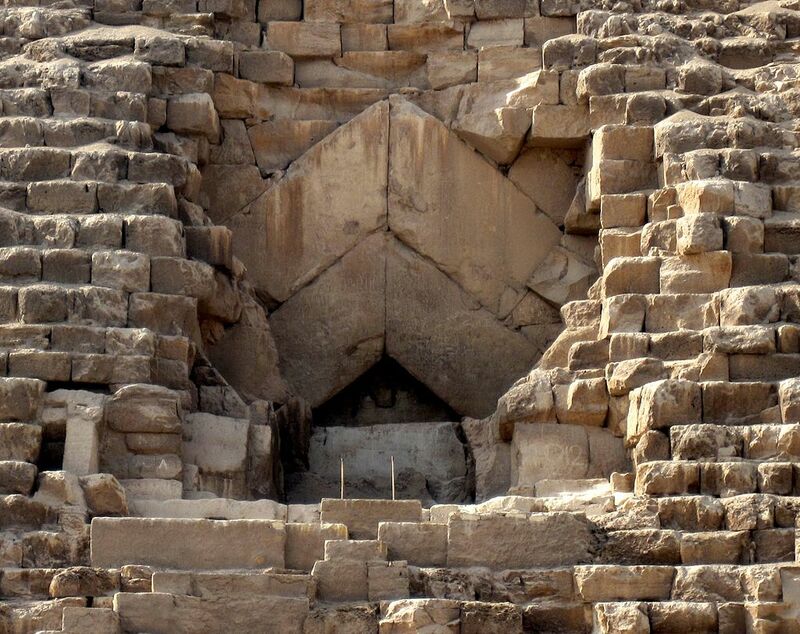 Swivel doors were found in only two other pyramids: Khufu’s father and grandfather, Snefru and Huni, respectively. 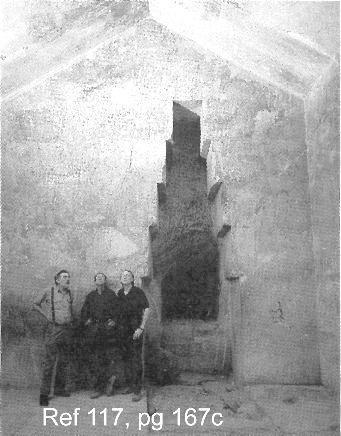 Reports say that when the pyramid was first broken into that the swivel door, weighing some 20 tons, was so well-balanced that it could be opened by pushing out from the inside with only minimal force, but when closed, was so perfect a fit that it could scarcely be detected and there was not enough crack or crevice around the edges to gain a grasp from the outside. Mass of the Earth: The calculated weight of the pyramid is at 5,955,000 tons. Multiplied by 10^8 gives a reasonable estimate of the earth’s mass. The Sun’s Parallax: The size of the earth as viewed from the Sun and expressed as an angle and generally equal to 1/2 the diameter at the equator (Solar Equatorial Parallax) is 8.9008091 seconds of arc using 91848,817 miles as the mean distance to the sun and 3,963.4914 miles as the equatorial radius. The distance between the mean socket level and the height of the leveled bedrock is 8.9008 Pyramid Inches. The Descending Passage pointed to the pole star Alpha Draconis, circa 2170-2144 BCE. At that time this was the North Star. No other star has aligned with the passage since then. The 344 ft length of the Descending Passage provides an angle of view of only +/- 1/3 of a degree. Alpha Draconis has not been in alignment for thousands of years. The next alignment will be with the North Star, Polaris, in about 2004 CE. Polaris in Greek means “Satan”. 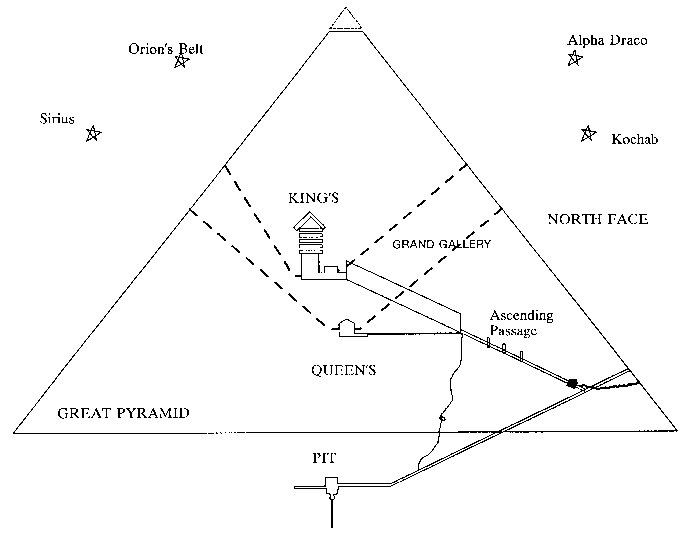 The southern shaft in the King’s Chamber (45 deg, 00 min, 00 sec) pointed to the star Al Nitak (Zeta Orionis) in the constellation Orion, circa 2450 BCE The Orion constellation is associated with the Egyptian god Osiris. No other star aligned with this shaft during that Epoch. The southern shaft in the Queen’s Chamber (39 deg, 30 min, 00 sec) pointed to the star Sirius, circa 2450 BCE Sirius is associated with the Egyptian goddess Isis and is also part of a unique ceremony practiced by the African Dogon tribe. Pyramids mirror Orion Constellation: The pyramid positions on the ground are a reflection of the positions of the stars in the constellation Orion circa 10400 BCE Five of the 7 brightest stars have pyramid equivalents: The 3 great pyramids of Khufu, Khafre, and Menkaura for the belt of Orion, the pyramid of Nebka at Abu Rawash corresponds to the star Saiph, the pyramid at Zawat al Aryan corresponds to the star Bellatrix. The only two missing star positions are for Betelgeuse and Rigel. 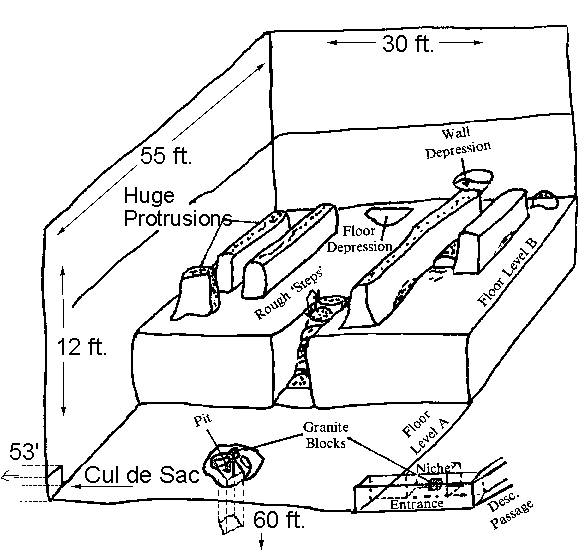 The above diagram is a cross section of the Great Pyramid showing the relative position of the major points of interest: There are two entrances. The first is the original entrance on the North face and opens to the Descending Passage. The second is the forced entrance created when the Pyramid was broken into and is shown by the darker tunnel. 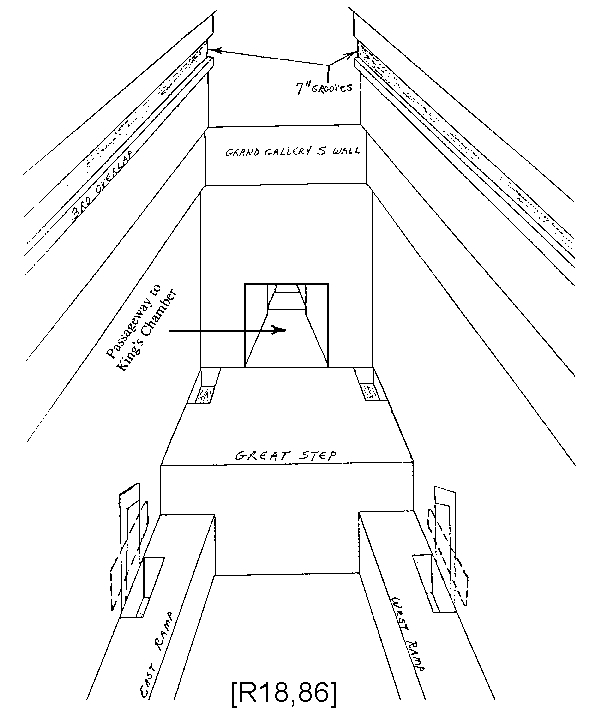 The descending passage continues beneath the blocks of the Pyramid and into the bedrock beneath and eventually leads to the horizontal shaft which connects to the Pit or also called the Room of Chaos. The Ascending Passage still has three major stone plugs blocking its upward journey where it connects with the Descending Passage but they have been tunneled around. Farther up the Ascending Passage are to be found the three girdle stones. Next comes both the horizontal passage to the Queen’s Chamber and the entrance to the Grand Gallery. Here also is found a tunneled passageway connecting the Ascending Passage to the Descending Passage through a very long, narrow, and twisty tunnel which appears to have been dug after the construction of the Great Pyramid and from the bottom up. Midway between is a larger cavity known as the Grotto. At the top of the Grand Gallery is a horizontal passageway into room called the Antechamber which appears to have had 3 rock portcullis slabs to block the entrance to the Kings Chamber which lies just beyond. 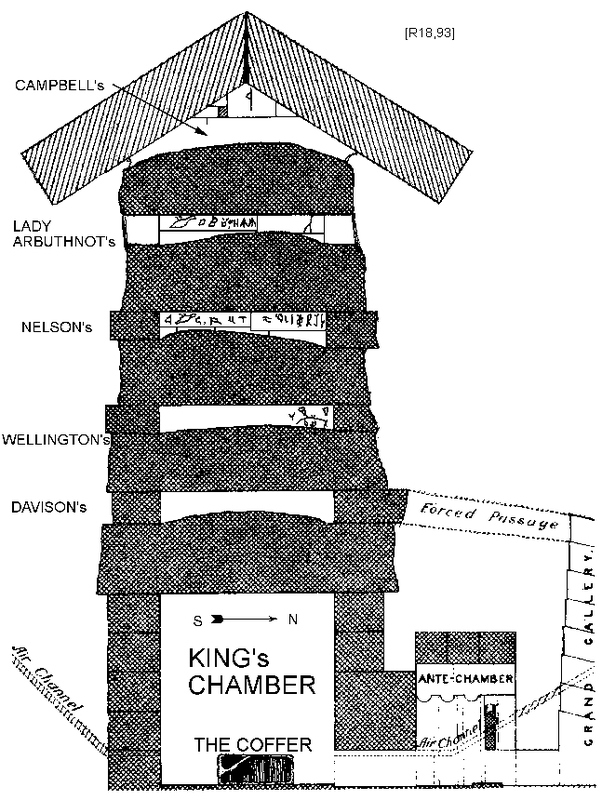 Above the King’s Chamber and connected from a small well shaft found at the top of the Grand Gallery is the first of 5 chambers thought to have been engineered to relieve the weight of the stones the Great Pyramid above the Kings Chamber. 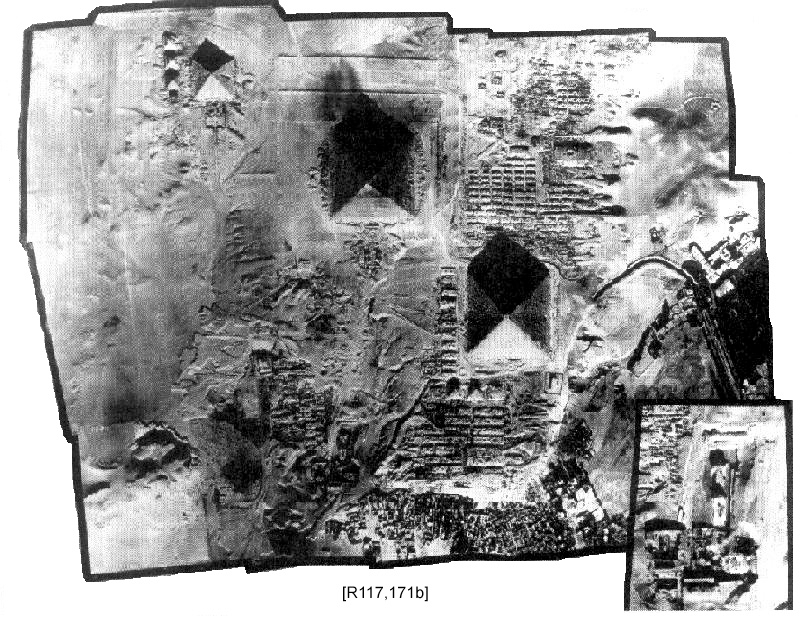 The above picture is a composite areal view of the Giza Plateau. Another view of the passages and chambers of the Great Pyramid. But unfortunately, the size reductions result in much loss of clarity from the original. 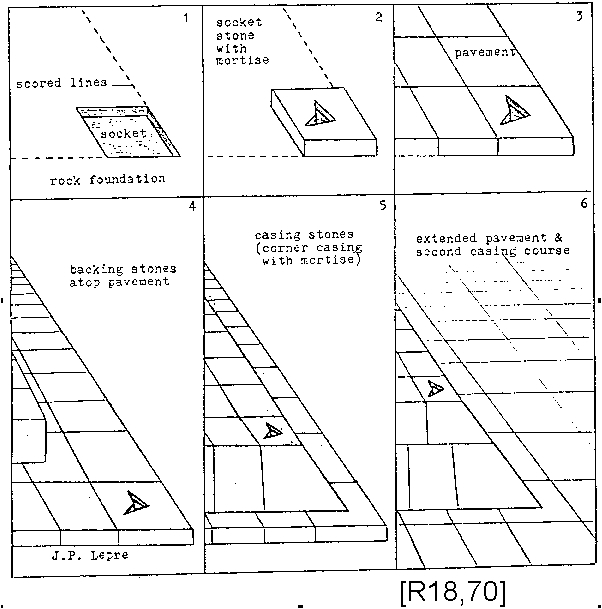 The Great Pyramid is the only pyramid which employed a ball and socket construction technique in the four corners. A socket was dug into the bedrock into which was placed corner foundation stones. By using a mortise and tenon on the blocks of the corners the Great Pyramid was affectively protected against shifts of the rocks due to expansion as well as protected from earthquakes. To a human standing on the ground near the Great Pyramid the faces appeared flat. However, from a distant aerial view with just the right lighting shows the faces have a very slight concave curve. This was apparently intentionally and the sketch shows the underlying block construction that was employed to produce the curvature. No other pyramid exhibits this intentional curvature. According to descriptions by an ancient historian Herodotus, the original door of the Great Pyramid is hinged at the top, and swung out. According to accounts of Al Mamoun, who created the forced entrance and followed the Descending Passage back up to the original door, the door was so well-balanced that a single man could open it from the inside, but when shut was nearly invisible and impossible to open from the outside. These are sketches by J.P. Lepre based on the descriptions of Herodotus. But neither sketch would seem to illustrate a door that closed without showing any cracks. 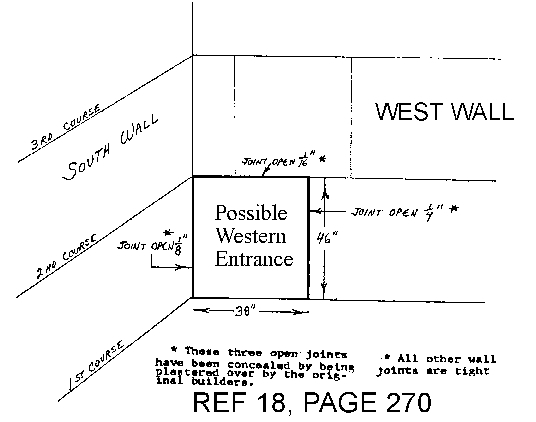 The diagram above is a sketch by J.P. Lepre [18,294] which illustrates a door that would swing in and when closed would have no cracks. It requires a cutout at the top of the passageway as well as a cutout at the bottom, both of which are consistent with the Descending Passage. Above, a photo from reference [117,167] of the view looking down the descending passageway. Very nearly perfectly straight along its 350 foot length. “The Pit” or also known as the Pit of Despair and Chamber of Chaos. 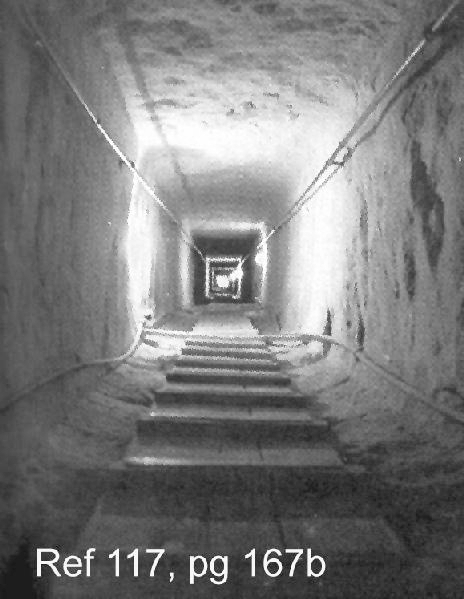 At the bottommost level of the Great Pyramid, a short horizontal distance from the end of the Descending Passageway is a subterranean chamber carved out of the solid limestone bedrock. It appears to have been left in an unfinished state and was perhaps the source of the rock used for other interior parts of the Great Pyramid or the source of the plugs used to seal the passageways. Curiously, although the floor is very uneven and the walls are rough, the ceiling is flat and smooth. A horizontal shaft some 30″ x 30″ extends to the left for 53 ft. in a snakelike way and culminates in a little cul-de-sac. The “pit” is some 8′ x 8′ and extends down some 60′. About 10′ down is a ledge with a large block of granite lodged there. According to J.P. Lepre, the last known excavation attempts of the “pit” were in 1865 and eventually abandoned when the workers had difficulty breathing in the stale air. The tomb of Queen Hetepheres, Khufu’s mother, was found at the bottom of a similar inconspicuous shaft nearly 100 ft. deep! Apparently the Egyptians thought that they could hide the tomb’s location by disguising it as a lowly side shaft, unworthy of a tomb. 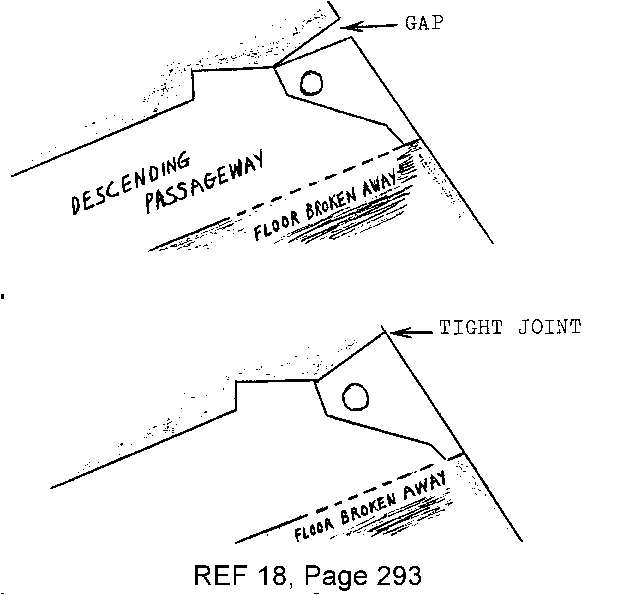 Spaced at intervals along the Ascending Passage way between the juncture to the Descending Passage and the Grand Gallery are found girdle stones. 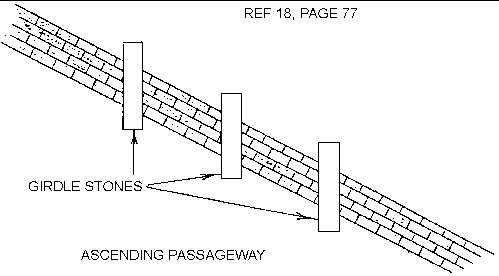 Once passing the blocking plugs at the beginning of the Ascending Passageway the stone blocks of the Ascending Passage are parallel to the slope of the passage but the girdle stones are aligned vertically in contrast. The passageway actually has four full girdle stones, constructed from a single block, and three 1/2 girdles, constructed as an upper and lower half. These girdle stones acted to support the weight of the remaining stones above. Above is a detail of a full girdle stone. The full girdle stones are truly massive as the center opening is nearly four feet square. The transport and installation of such large single stones is another amazing construction mystery. 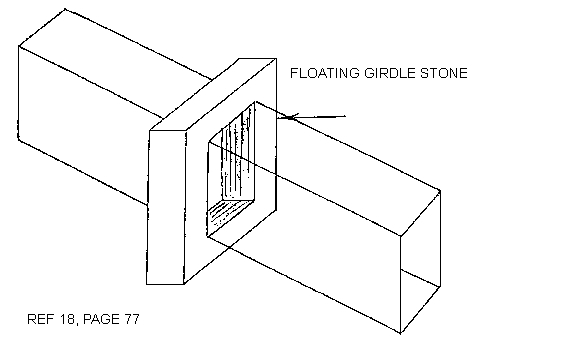 The girdle stones are also designed floating from the passageway. Above, a photo from reference [117,167] of the Queen’s Chamber. From the book “The Message of the Sphinx” by Graham Hancock and Robert Bauval. The authors appear in the photo, from left to right: John Anthony West, Robert Bauval, Graham Hancock. The view at the top of the Grand Gallery looking into the passage to the King’s Chamber. The grand gallery is some 28 feet high and composed of 7 stone layers. Each layer constructed in some 3 inches so that the gallery narrows from 7 ft at the bottom to about 3-1/2 feet at the ceiling. Some 40 overlapping stones form the ceiling. There is a set of parallel groves in the 3rd layer some 7 inches high that run the length of the Grand Gallery. Some theories are that the stones that plugged the descending passageway were originally stored in the ceiling cavity of the Grand Gallery. Other theories are that the ceiling was originally lined with cedar. Side view of the King’s Chamber and Antechamber found at the top of the Grand Gallery. There is evidence in the Antechamber of the existence at one time of at least 3 portcullis slabs, evidently for blocking access to the King’s Chamber. Another view of the King’s Chamber showing the five different relieving chambers constructed above it. To relieve the tremendous weight above the King’s Chamber, it is believed that the design incorporated this thought into the architecture. The topmost chamber is gabled and translates the weight to the walls. One of the chamber’s wall are limestone which is more easily crushed than the granite of the other chambers to accommodate shifts and settling. The walls of the King’s Chamber are not connected to the floor to further isolate the floor from any shifting or settling. View showing the air shafts to both the King’s and Queen’s Chambers. The “air shafts” to the Queen’s Chamber originally stopped a few inches short of piercing through the blocks of the walls. Once discovered, they opened them up the rest of the way. 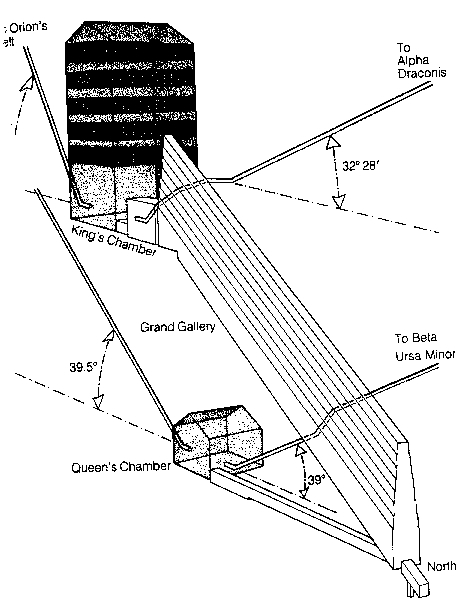 The southern ‘air shaft’ in the King’s Chamber extends some 175 feet before exiting the Great Pyramid at the 101st stone course while the northern ‘air shaft’ extends some 235 feet. The ‘air passage’ on the southern wall of the King’s Chamber changes shape three times. It starts out domed shaped, then shifts to an oval, and finally to a rectangular oblong shape. All together it undergoes two sharp bends. The northern air channel is consistently rectangular in shape, but takes four turns in direction as it connects to the outside. A possible access to a secret room in the King’s Chamber. According to J.P. Lepre, if you look at all the wall joints of the stones in the King’s Chamber you can discover that on the bottom level of the West wall the end-most stone has joints which are larger than the other stones. These larger joints have been filled in with a plaster to match the mortar and make them blend in. He believes this was done by the original builders and that this stone is a highly likely place for an access to another tunnel or chamber. 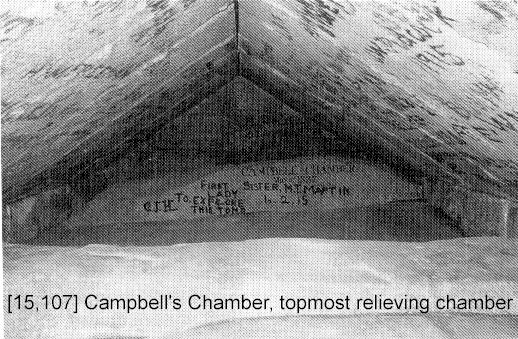 An interior picture of the topmost relieving chamber above the King’s Chamber, known as Campbell’s Chamber. Although the picture quality is poor you can make out some graffiti on the ceiling and walls. The topmost chamber has a gabled roof almost 7 feet high. The huge granite stones in the gabled roof act to distribute the great weight of the masonry above. this weight is then shifted on the side walls of the relieving chambers. 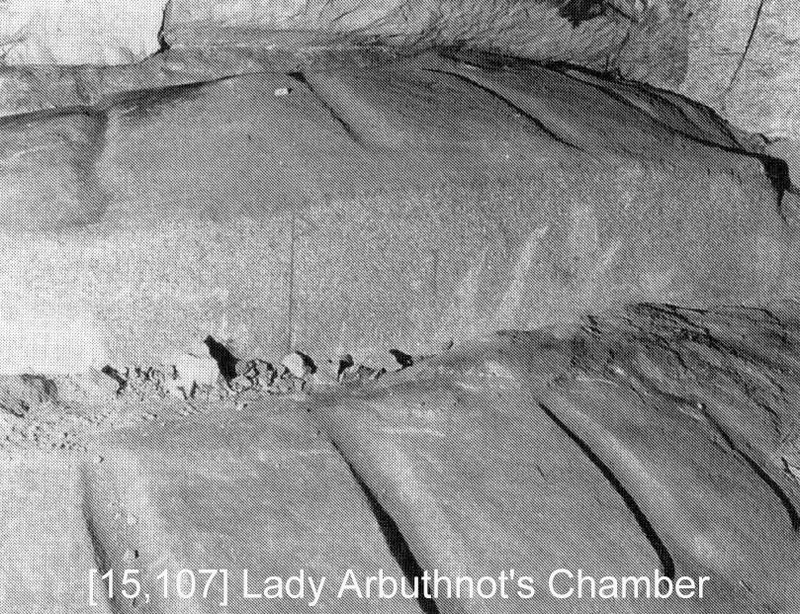 An interior picture of the fourth relieving chamber above the King’s Chamber, known as Lady Arbuthnot’s Chamber in honor of her visit while Howard Vyse was discovering the various chambers in 1837. This is a picture of the floor. The floor sections of the fourth chamber have deep grooves. There are some red ocher lines not found in the other relieving chambers. Some hieroglyphics as well. The side walls are constructed from limestone, unlike the three chambers below which have side walls of granite. A building technique assumed to compensate for the great weight pressing down from above. A calculation from the crushing of the limestone may have been foreseen to occur rather than the cracking of the granite. 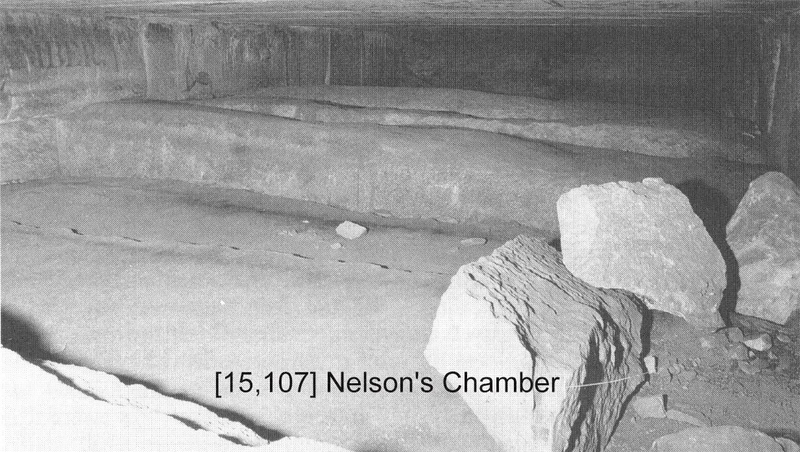 An interior picture of the third relieving chamber above the Kings Chamber, known as Nelson’s Chamber. Here the large stones making up the floor are very uneven in height and thickness, however, the ceiling of the chamber below (Wellington’s Chamber) is almost even. Reports show that Nelson’s Chamber have the best preserved hieroglyphics from the quarry teams. 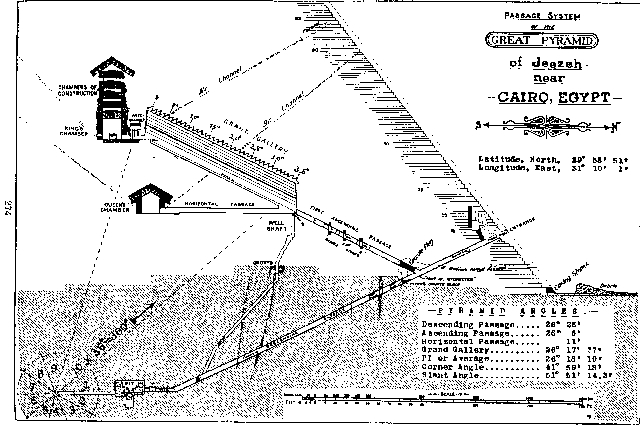 A possible marker for a secret entrance to the Great Pyramid as suggested by J.P. Lepre. He has observed that all tunnels, room entrances, and the like show that variations in the stonework and joints near these entrances occur. He has located a huge oblong stone outside of the Great Pyramid that is flush but at an angle with the rest of the masonry. His suggestion is that this could be a cover for a passageway or chamber. The Great Pyramid Text of Scripture, Isaiah 19:19-20, in Hebrew. This diagram illustrates yet another numerical relationship! The Great Pyramid a true masterpiece and has rightly earned the title of a “Wonder”. It was built with such precision that our current technology cannot replicate it. 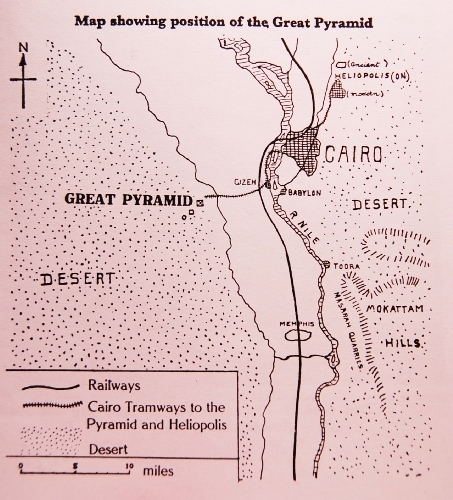 Today tourists enter the Great Pyramid via the Robbers’ Tunnel. This tunnel was already dug during the First Intermediate Period or during the New Kingdom period and re-opened by workmen employed by Caliph al-Ma’mun around AD 820. The tunnel is cut straight through the masonry of the pyramid for approximately 27 metres (89 ft), then turns sharply left to encounter the blocking stones in the Ascending Passage. This strongly indicates that the robbers must have known a lot about the inner architecture. Unable to remove these stones however, the workmen tunnelled up beside them through the softer limestone of the Pyramid until they reached the Ascending Passage. It is possible to enter the Descending Passage from this point, but access is usually forbidden. In its original state, shining in the sun, and so reflecting its rays, the Great Pyramid was supposed to be visible from the moon as a brilliant star on earth. This phenomenon was caused by the smooth highly polished limestone blocks of which the Pyramid was originally covered. These blocks, called casing stones, covered the four sides. Each side having an area of five and one-quarter acres, acted as gigantic mirrors, reflecting great beams of light that could be seen for many miles around. The great earthquake of the 13th century A.D. shook the structure, cracking its face and dislodging some of the casing stones. These loose stones gave an idea to builders in the nearby cities. 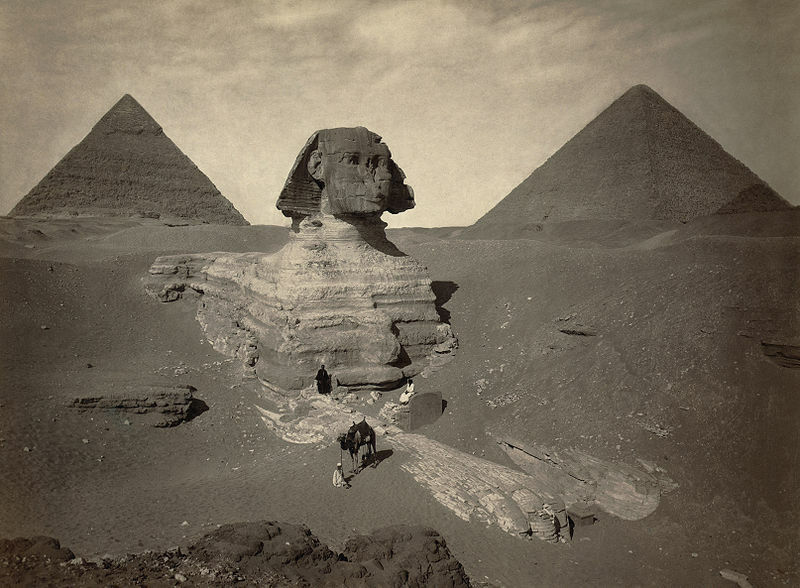 They began to use the Pyramid as a quarry, with the result that in a few centuries all but a few casing stones, hidden by sand, were stripped from the face, leaving the core masonry as we see it today, exposed to erosion by the elements. The core masonry is composed largely of coarse limestone (nummulitic), mostly from the Giza Plateau itself, on which the Pyramid is built. The number of these yellow limestone blocks was estimated at about 2,300,000 by Sir Flinders Petrie, Egyptologist. They average approximately two and one-half tons each, but many are considerably heavier. 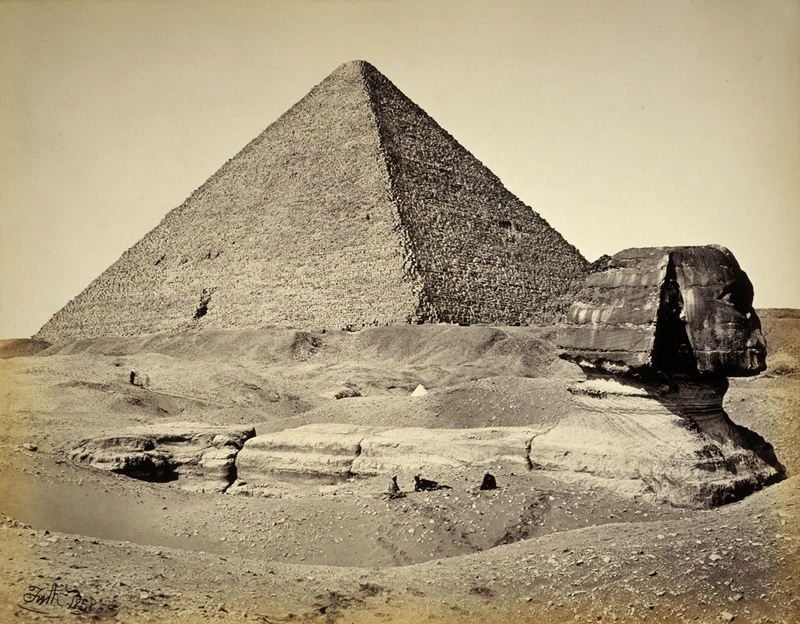 The few casing stones found “in situ” by Colonel Howard Vyse, Egyptologist, in 1837 made it possible to determine the original baseline of the structure and also the exact angle of its sloping sides. The casing stones consist of dense, white, marble-like limestone and exhibit an amount of accuracy in fitting that equals the most modern optician’s work. The joints, with an area of some 35 square feet each, are not thicker than aluminum foil; yet they include between the polished surfaces an extraordinarily thin film of white cement. Petrie in his account of these stones records, “The mean thickness of the joints is one-fiftieth part of an inch; and the mean variation of the cutting of the stone from a straight line, and from the true square, is but one-hundredth part of an inch in the length of 75 inches up the face.” That they were able to maintain these tolerances despite the area and the weight of the stone to be moved—some 16 to 20 tons each— is seemingly almost impossible. This feat was duplicated in all the casing stones, which were estimated to have numbered approximately 144,000. They were brought from over nine miles and across the Nile River. Col. Vyse, speaking of the cement says, “…such is the tenacity of this cement….that a fragment of a stone that has been destroyed remains firmly fixed in its original alignment, notwithstanding the lapse of time and the violence to which it has been exposed.” Modern chemists have analyzed this cement but have been unable to compound one of such fineness and tenacity as that exhibited in the Great Pyramid. Today, the Pyramid, at a distance, looks like a great rock pile. Nearer at hand, it is seen that the stones, composing the structure, which are roughly cut, are laid in even course, one upon another. These courses form a series of gigantic steps, sloping back from the base on all four sides, to a level platform at the top. Situated ten miles to the southwest of Cairo, the capital of Egypt, the Great Pyramid stands on the northern edge of the Giza (Gizeh) Plateau, 198 feet above sea level, in the eastern extremity of the Libyan section of the Great Sahara Desert. Gizeh is an Arabic word for the edge or border. Thus, the “Great Pyramid of Giza” means the “Great Pyramid of the Border” in English. The Great Pyramid was placed in the exact center of all the land area of the world. 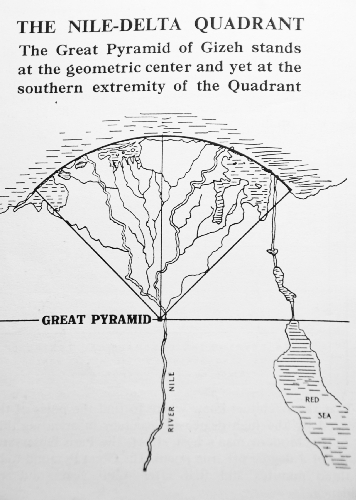 Lines drawn through the north-south and east-west axis of the Pyramid divide equally the earth’s terrain. The north-south axis (30° 9′ meridian east of Greenwich) is the longest land meridian, and the east-west axis (29° 58′ 51″ north), the longest land parallel. That the Architect knew where to find the poles of the earth is evidenced by the high degree of accuracy in orienting the building true north. Modern man’s effort, the Paris Observatory, is six minutes of a degree off true north. The Great Pyramid today is only off three minutes and that after 4200 years, due mainly to subsidence. Such near perfect orientation is exceedingly hard to secure, even with modern astronomical equipment, and seemingly impossible without it. If the knowledge of the magnetic needle was known it would have been of little value,. It points to the magnetic north, not to the true north. The celestial pole is a point, usually a star, through which the polar axis of the earth would pass were it projected to the star sphere. 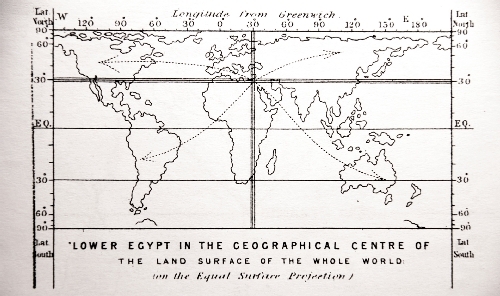 Lines produced from the two diagonals of the Pyramid, to the northwest and northeast, enclose the Nile Delta; thus embracing the fan-shaped country of Lower Egypt. The southern extremity, being the northernmost edge of the Giza plateau where the Great Pyramid stands looking over the fan-shaped sector of Egypt, was in ancient times at the boundary where the cultivated land touched the desert. It was this unusual location that first suggested the Great Pyramid was the monument spoken of in the scriptures by Isaiah the prophet in Isaiah 19:19-20 (see here). Since the full official name of the Pyramid, the Great Pyramid of Giza, means, in English, the Great Pyramid of the Border, the answer to the apparently contradictory definition of Isaiah is found in the Great Pyramid. The only spot on the face of the earth that completely answers this description, both geometrically and geographically, is the precise place where the Great Pyramid actually stands. An ancient treatise on Masonry (The Legend of the Craft) states that all sciences are founded upon one science and that science is Geometry. Few persons not conversant with geometry recognize its great usefulness of geometrical reasoning, or realize how much it enters into modern technology, especially engineering. 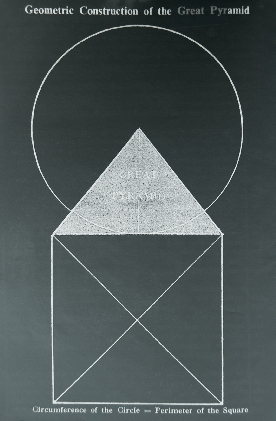 The Great Pyramid is, internally and externally, geometrical in conception and design. For this reason, the problem of the Great Pyramid is essentially one to be solved, not by the Egyptologist as such, but by the engineer, since it has been erected on principles easily recognized and understood by the construction engineer. Merely exploring the structure will reveal nothing as regards to its true purpose. A knowledge of geometry and mathematics, combined with an understanding of their proper applications, is essential to a correct understanding of the Great Pyramid and its design. It is not by hieroglyphics nor by sculpture work, but by symbol, measure and angle, that the Great Pyramid of Giza, in the land of Egypt, yields its secrets. Scientifically directly surveys have furnished the actual geometric measurements of the Pyramid. From these measurements calculated data was obtained which revealed the Great Pyramid to constitute a geometrical representation, on a vast scale, of mathematical and astronomical knowledge not to be known, again, for over 4500 years. The remarkable manner in which this knowledge is geometrically expressed, relative to certain simple mathematical formulae, surpasses in every way, any similar undertaking of man. The unit of measure employed in the actual construction of the Great Pyramid was the Egyptian Royal Cubit. However, the linear unit predominating in the design of the Pyramid is the Sacred Cubit, which is shown on the Boss in the Ante-Chamber. A scientific examination of the Sacred Cubit found it to bear an exact relationship to the size of the planet on which we live. This Cubit is the exact 10,000 000th part of the distance from the center of the earth to the pole, or semi-axis. According to the geodetic research in the International Geophysical Year 1957-1958, the polar radius of the earth, as deduced from observations of the orbits of artificial satellites, is approximately 2949.89 miles. Divide this figure by 10,000,000; the result is 1 Sacred Cubit (25 Pyramid inches) or 25,0265 British inches. Thus the earth’s polar radius measures 10,000,000 Sacred Cubits or 250,000,000 Pyramid inches; hence the Pyramid inch is the 500,000,000th part of the earth’s polar diameter. If this method of arriving at a measure of distance seems unusual, consider the French metre, conceived as a unit of linear measure based also upon the size of the earth. The French metre was arrived at by taking the 10,000,000th part of the so-called “quadrant of the earth” as calculated from the North Pole to the equator, along a meridian passing through Dunkirk. As the earth is not a perfect sphere, the said distance is not a true quadrant, hence it is not truly scientific to determine a unit of straight measure from such a surface. The calculations were subsequently found to be slightly in error. Thus, the Designer of the Great Pyramid long forestalled modern man in the scientific idea of having a unit of measure based on the size of the earth, and therefore knew the exact dimensions of the earth. It is amazing to what a small extent the original perfect inch, as still preserved in the Great Pyramid, has fluctuated down through the ages. The inch as now used in Britain, after all these long centuries, only deviates from the original scientific standard by approximately a thousandth part of an inch. The USA inch, differing insignificantly from the British inch, may be regarded as being practically identical. As we go back into history, we find that the British inch deviated even less from the original true scientific inch of the Great Pyramid, and it is not unlikely that it was derived from it. It is worthy of special note that the entire geometric structure of the Great Pyramid is designed on the basis of p (pi), 3.14159, the mathematical ratio upon which the whole physical universe is designed, and the value of y, 365.242, the number of days in Earth’s solar year, (the time interval in days between two successive vernal equinoxes in the earth’s journey around the sun). In mathematics, p (sixteenth letter of the Greek alphabet) is the ratio between the circumference of a circle and its diameter (the straight line through its center). That is to say, the circumference of any size circle is always 3.14159 times its diameter. This sign has been adopted because of the fact that the ratio in question has never been ascertained to its finality, although of course, it has been calculated to an exceedingly high degree of precision, namely, to over 5,000 decimal places (to 15 places of decimals it is 3.141592653589793). The amazing fact that this geometric ratio p , which pervades the whole universe, from the vast solar systems to the tiniest atoms, also pervades the Great Pyramid, was first revealed by the angle of the slope of the Pyramid’s sides. This angle results in the Pyramid’s vertical height bearing the same ratio to the perimeter of its base that the radius of a circle bears to the circumference. See the following diagram. In other words, if the height of the Pyramid to its apex be taken as the radius of a circle, the distance around the Pyramid is found to be exactly equal to the circumference of that circle. The required angle of the slope of the Pyramid’s sides to produce this result is consequently known as the pyramidic p angle and is 51° 51′ 14.3″. No other pyramid in the world is built at this angle. Although the squaring of a circle is an insoluble problem, if we use the incommensurable number of p, the Pyramid’s design, for all practical purposes, this accomplishes the squaring of the circle. Nearly all the dimensions of the interior (and the architect’s design of the exterior) are expressible in terms of the length of the solar year. The square base circuit of the Pyramid equals 36,524.2350 inches. The measurements of the interior chambers reveal the length of the Ante-Chamber to be 116.26025 inches. Multiplying that figure by 25 (the Sacred Cubit) and again by p , equals the base side lengthy of the Pyramid. The Ante-Chamber length, multiplied by p , alone, equals 365.2423 inches. The distance from the exact center of the Ante-Chamber to the south wall of the King’s Chamber is also 365.24235 inches. The Geometric measurements can be seen, in all cases, as simple geometrical functions of the year-circle, the latter being a circle whose circumference, in Pyramid inches, is 100 times the number of days in the solar year. The form, arrangement and detail of the Pyramid’s exterior, and of its interior passages and chambers, can therefore be built up entirely from the geometry of the year-circle. This fact implies the possession of a knowledge of mathematics, geometry and astronomy, combined with the ability to express them in structural form, far in advance of contemporary knowledge of that time. 1). The sun’s distance from the earth: For over 2,500 years man has struggled to solve this problem. The Greeks in 500 B.C. judged the distance to be about ten miles, later guessing it to be more like 2,000 miles. In later centuries man estimated it farther and farther away, until in the 16th century it had increased to 36,000,000 miles. The latest figures of modern astronomy give 92,900,000 miles as the sun’s mean distance from the earth. As there was absolutely no way of calculating this until recently, scientists were astounded to discover that built into the Great Pyramid’s base plans was a figure approximating 93,000,000 miles. 2). The mean density of the earth: The true mean density or specific gravity of the earth has also been an age-old problem. An average of prominent tests has placed it at 5.672 times the weight of water at 68 degrees Fahrenheit. The Pyramid places it at 5.7, a figure closely approximating the average estimates. 3). The weight of the earth: Knowing the density of the earth enabled physicists to ascertain its weight to be approximately 5,300,000,000,000,000,000,000 tons (in USA tons, about six billion trillion). The earth’s weight and the weight of the Pyramid were found to be proportionately related to one another. The Pyramid’s weight of approximately 5,300,000 tons has been noted to be 1,000,000,000,000,000 (USA one thousand trillionth) the weight of the earth. 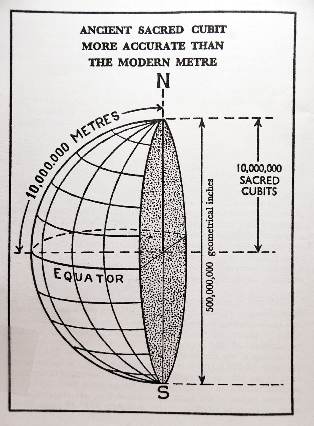 It is not unreasonable to assume that the Architect used this proportion to indicate the weight of the earth. 4). Volume of the earth’s crust above mean sea-level; The vast amount of surveying necessary to determine the average height of all the land on earth would have been an impossible task even a few hundred years ago. With the advent of aerial photography and the accumulation of data from continuing geological surveys, together with modern computers, an estimate is now given as approximately 455 feet. The top of the Pyramid, as the builders left it unfinished, is fully 454 1/2 feet. 5). Mean ocean level of the earth: The mean ocean level was found to approximate 193 feet 7 inches below the baseline of the Great Pyramid. Again, modern computers and the findings of modern oceanography were required to ascertain this figure. And again the design of the Great Pyramid foretold this fact. It was found that taking twice the diameter (1,162.6″) of a circle having a circumference of 3,652.42″ (a circle again related to the solar year and base circuit of the Pyramid) gave a result of 2325.2″ or just slightly over 193 feet 7 inches. This ancient wonder in architecture based upon the geometry of the year cycle is shown to be in harmony with the earth’s design. 6). Mean temperature of the earth: As the Great Pyramid stands on the line which equally divides the surface of the northern hemisphere, there is a relationship between its climate and the mean temperature of all the earth’s surface. This temperature is about 68 degrees Fahrenheit. In the Pyramid this temperature is maintained permanently and unvaryingly in the King’s Chamber. Two air channels, when cleaned of sand, were found to keep this chamber at the normal of mean temperature, which temperature is exactly one fifth of the distance between the freezing and boiling points of water. Scientists say that 68 degrees Fahrenheit is the ideal temperature for the existence of man. 7). Rotundity of the earth: The rotundity, or curvature, of the earth was found by surveying the side baseline of the Pyramid. Due to the hollowed-in core masonry (35.76 inches on each side) a curved line was produced. Computations were made to ascertain how long the radius would be that would produce a circle containing that curve. The resulting answer was that the radius would bew approximately half the diameter of the earth. 8). Golden Rule of Architecture: The Great Pyramid confirms perfectly to the recognized laws of harmony and beauty. The Egyptians, Cretans, and Greeks all knew about the Golden Rule of Architecture, also called the “Golden Number.” Such architectural masterpieces as the Parthenon on the Acropolis, at Athens, conformed to it, but not with the high degree of mathematical precision to be found in the Pyramid built over 2,000 years earlier. This “Golden Number,” when worked out, turns out to be the cosine of the p angle of the Great Pyramid, expressed as correct to three decimal places, namely, 0.618; in other words, the ratio that the distance from the center of the Pyramid’s base out to each of the four sides bears to the oblique height of the Pyramid’s faces, is precisely the Architect’s Golden Number, correct to three decimal places. Ancient Egypt seems to possess, to a remarkable degree, an advanced knowledge of mathematics and kindred sciences, but they were never able to duplicate the proportionate mathematical system of numbers found in the design of the Great Pyramid. 1. The breadth of the King’s Chamber, equals half its length. 2. The height of the King’s Chamber, equals half the diagonal of its floor. half the breadth of the King’s Chamber. of the square base of the pyramid. base side length, plus the vertical height of the pyramid. The pyramid’s Sacred Cubit itself is comprised of 25 inches (5 times 5 inches) and this inch is the 500,000,000th part of the Earth’s axis of rotation. 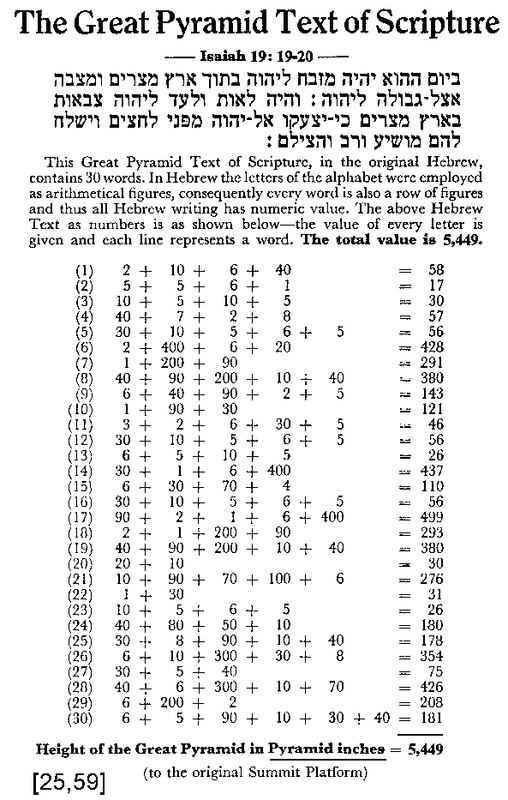 Although an examination shows that the Pyramid numerics are geometric, there is one arithmetical number that is prominent in the pyramid, and that number is 5. The number 5, and multiples, powers and geometrical proportions of it runs through the Great Pyramid and its measure references. The floor of the Queen’s Chamber is 5 times 5 courses of masonry from the base upwards and its measures all answer to a standard of 5 times 5 inches. The King’s Chamber floor is 10 times 5 courses from the base and its walls are composed of 20 times 5 stones, arranged in 5 horizontal courses. The Pyramid itself has 5 corners (four at the base and one at the apex), 5 sides, four equal triangular sides and the square under-side on which it stands. The name pyramid comes from the Coptic word “pyr” that means division and the word “met” that means ten, suggesting the number 5 (i.e. dividing 10). Periods of 5 years are the integral units with which the whole structure of prophetic chronology is built up in the Bible. The prophetic chronological numbers 5, 10, 15, 40, 50, 65, 70, 100, 120, 360, 390, 400, 490, 1000, 1260, 1290, 1335, 2300, and the “Seven Times” prophecy (2520 years) are all multiples of 5. The number 5 symbolizes “Grace” (The number 5 is the designation of the 5th letter in the Hebrew alphabet, “He” (in English, pronounced “hay”) — see also Abram and Sarai found Grace with the Lord and why their names were changed by the Lord). Multiples of 5 were also the dimensions of Noah’s Ark, the Wilderness Tabernacle and Solomon’s Temple. The base circuit of the Great Pyramid contains a great wonder. As our earth has three separate lengths of years: (1) the solar tropical year, (2) the sidereal year, and (3) the anomalistic year, so were the baselines and walls of this Pyramid constructed, with three different lengths of circumferences. The measurements designating the three astronomical years were found in the hollowed-in core masonry on the faces of the Pyramid. Hidden by the original straight planes of the exterior casing stones of the pyramid, they would never have been revealed except for the removal of the casing stones. These different cycles have to do with the earth and its relation to both the stars and the sun. The earth rotates on a plane inclined to the ecliptic. This motion from west to east every 24 hours gives us day and night and occurs at the rate of 1,000 miles per hour at the Equator. While spinning like a top, the earth is also racing in its orbit around the sun anti-clockwise at the much higher rate of speed of 1,000 miles per minutes. The tilt in the earth’s axis causes the four seasons. The solar year is the period in which the sun appears to pass over the earth 365.24235 times or days between the vernal equinoxes. The sideral year is the interval between the earth’s position at any time in the year, in relation to the fixed stars, and its return to the earth 365.25636 times during the circuit. This difference of about 20 minutes is due to the earth’s slow second rotation clockwise, thus causing the solar tropical year to be shorter. The anomalistic year is the interval between successive annual returns of the earth to the point — defined as the perihelion — in its orbit nearest the sun (Jan 2-3). This requires 365.25986 days, or about five minutes longer than the sideral year, due to the motion of the earth’s orbit. Another very important movement related to astronomy is the great cycle of time which is called the precession of the equinoxes. It is the time interval in which the earth’s pole makes one complete circuit around the pole of the precession, an effect connected mainly with the gradual change of the direction of the earth’s axis of rotation. This period of time varies, being greater or less, depending on from what stage of its movement it is calculated. Modern science gives the cycle as approximately 25,800 years. It is noted that the sum of the two diagonals of the Pyramid’s full designated base (12,913.27 pyramid inches) x 2 = 25,826.54, a figure considered by some scholars to represent the precessional cycle. There are other remarkable examples of interlocking mathematical solar distances found in the design of the pyramid, demonstrating the Architect to have preceded modern astronomers by over 4000 years. With regards to its astronomical position, it seems the builders intended to place the Pyramid as close as possible in latitude 30 degrees — that latitude where the true pole of the heavens is one-third of the way from the horizon to the point overhead (the zenith), and where the noon sun at true spring or autumn (when the sun rises almost exactly in the east, and sets almost exactly in the west) is two-thirds of the way from the horizon to the point overhead. 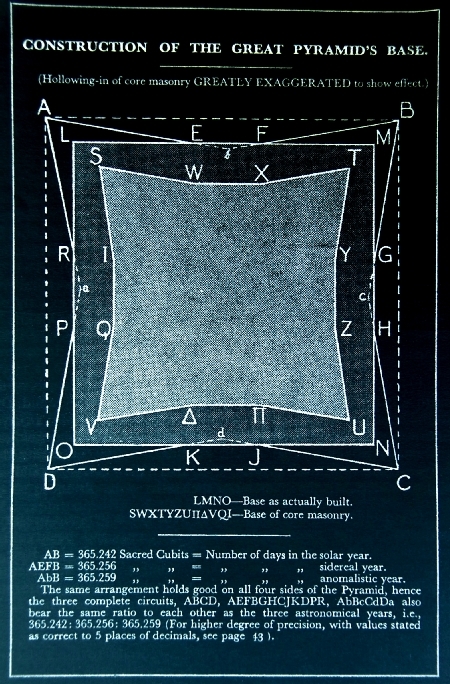 Star observations, made from this position, would simplify many problems in the geometrical construction of the pyramid. That the Great Pyramid was constructed according to astronomical observations of great accuracy is beyond doubt. And to achieve such exactness without modern scientific instruments is, seemingly unbelievable. The alignment of the Pyramid can be determined from a sighting of the Pole Star. This sighting could be accomplished by boring a slanting passage, in the solid rock, positioned so as to point to the Pole Star when due north. Such a boring exists beneath the base of the pyramid, running some 350 feet through the solid rock (the lower portion of the Descending Passage). This passage is found to be in exact alignment with the true north. In response to a question if the North Star ever shone directly down the Descending Passage, Sir John Herschel, the famous astronomer Royal of England, ascertained in 1840 that only in the 22nd century B.C. did the then North Star or Pole Star, known as Draconis (Dragon Star), so shine. No other Pole Star in history has ever been in that exact position. Connection with the Pleiades and Seven Stars (“Seven Sisters”) stellar cluster in the constellation of Taurus (the Bull) and the mention in Job 38:31. Measurements in inches, backward or forward from the Scored Lines, represent the corresponding number of years before or after that astronomically fixed date. To test the accuracy of this starting date was relatively simple. The date, being so far back in history, allows ample testing against known recorded historical events. Putting it to the actual test consisted of measuring the passages and chambers up and down from the Scored Lines, counting one year for each inch. 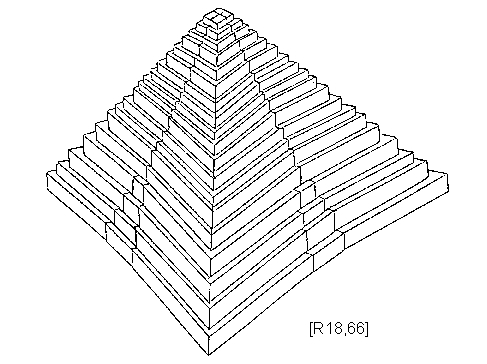 The pyramid is not made of elastic, but of rigid stone, so that measurements cannot be stretched nor shortened. We can only take the dimensions of the passages, just as they were constructed by the ancient builders, and let the results take care of themselves. The distance measuring back up the Descending Passage from the Scored Lines is 482 pyramid inches, representing 482 years. Counting 482 years back from the datum line of 2141 B.C. brings us to the year 2623 B.C. This was the year that work on the construction of the Great Pyramid began. As the passages of the pyramid’s interior symbolized ages which were then future, this date for the entrance to the pyramid was most appropriate. Measuring 688 inches beyond the Scored Lines down the Descending Passage to an aperture appearing in the roof, marks the entrance to the Ascending Passage. Progressing 688 years from 2141 B.C. gives the date of 1453 B.C. This was the date of the Exodus of the Israelites from Egypt and their receiving the law through Moses on Mt. Sinai. The time of the first Passover (just before leaving Egypt) to the crucifixion of Jesus Christ is commonly referred to as the “Dispensation of the Law” period, ending with Jesus being the first man able to keep the law perfectly, he fulfilled it, thus ending that dispensation. This period of time has been considered by most Bible chronologists as being 1485 years. As the date for the Exodus was 1453 B.C. and that for the Crucifixion was 33 A.D., the interval between them is an inflexible 1485 years. Measuring up the Ascending Passage at the given scale of an inch to a year, we find the length is 1485 inches and therefore the end of the passage marks precisely 33 A.D. (spring). Note that the rule for determining the A.D. date is to deduct the figures of the B.C. date from the total period and add 1, thus 1485 – 1453 + 1 = 33 A.D, because there is no zero year. 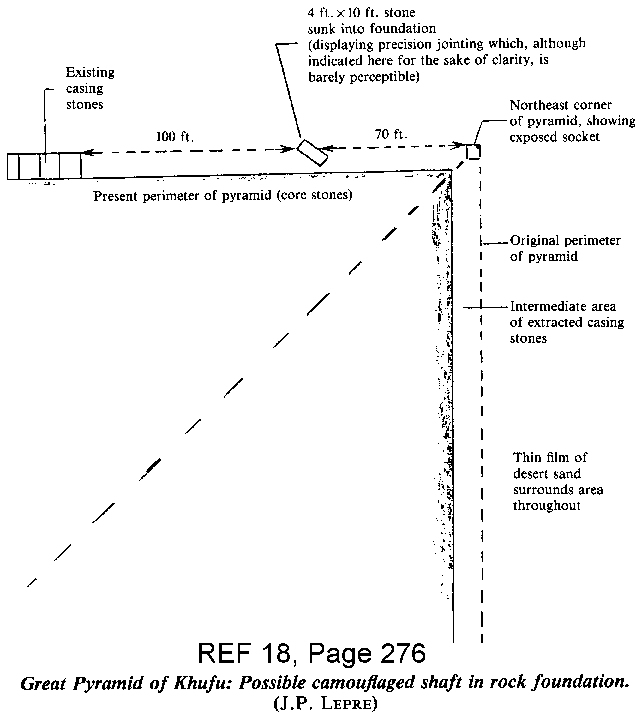 The Great Pyramid’s chronological representation depends upon the angle of the slope of the Passage System. This angle (26 degrees 18 minutes 9.7 seconds) is called the “Christ Angle” and forms the “Christ Triangle (see figure below). This angle of slope, when taken as a “rhumb line” (not a great circle arc) bearing north of true east, describes, from the Great Pyramid, a direct route that passes successively over Israel’s crossing of the Red Sea (sea of reeds), through Bethleham, and over Israel’s crossing of the Jordan. The two crossings define that beginning and ending of the children of Israel’s “wanderings,” after coming out of Egypt. (see figure below). The distance from the Great Pyramid to Bethlehem, along the great circle arc, is 2139 Pyramid furlongs (1 Pyramid furlong = 8000 Pyramid inches). If we start from the Pyramids astronomically fixed datum year 2141 B.C. and apply the scale of a furlong to a year, we obtain not only the place where Jesus was born, Bethlehem, but also the exact time when He was born, considering 2139 years after 2141 B.C. marks the date, 2 B.C. A confirmation of the chronology of the “Christ Triangle” can be found in the Book of Daniel of the Bible which not only solves the problem of the “70th week of Daniel” (past or future) but identifies the true Messiah. All of the above enumerated events, given in the prophecy, were due to be accomplished by the close of the 70 “weeks.” God has His own scale for chronological prophecies and this is stated in Ezekiel 4: 6, “I have appointed thee each day for a year.” The scale is 1 day to a year. This scale is applicable throughout the Bible. Seventy weeks would be (70 x 7) 490 prophetic days, equal to 490 years. The following tabulation shows these prophecies and their fulfillments. “Behold the Lamb of God (Christ) which taketh away the sin of the world” (John 1:29). Christ died for the ungodly . . . When we were enemies we were reconciled to God by the death of His Son” (Romans 5:6,10). If any man sin we have an advocate with the Father, Jesus Christ the righteous, and he is the propitiation for our sins: and not for ours only, but also for the sins of the whole world” (1 John 2:1-2). The vision and the prophecy was fulfilled in Jesus Christ (the Messiah) as recorded in the New Testament. Furthermore Jesus Christ, Himself, quoted Daniel’s prophecies, thus confirming Daniel as a Prophet. “To anoint the most Holy.” Christ Himself chose 12 Apostles, who were appointed to form the foundation of the coming Heavenly Kingdom (Rev. 21:14). These, as the most holy, were anointed by the Holy Spirit, at Pentecost, the 50th day after Christ’s resurrection and given miraculous powers. To find the time of Christ’s death and resurrection, as foretold in Daniel’s prophecy, we must therefore ascertain the beginning of the 70 “weeks” and count 490 years from that date. Verse 25 gives the beginning as the “going forth of the commandment to restore and to build Jerusalem,” which would be the SECOND return of the Israelites from Babylonian Captivity. The first was in the days of Cyrus, when some returned to rebuild the Temple; the second, in the days of Ezra and Nehemiah, when another contingent returned to restore the city and the walls. Thus, Ezra received the commandment to set out for Jerusalem in the month of Nisan, of Artaxerxes’ 7th year (hence Nisan 458 B.C.). He arrived, in Jerusalem, four months later, whether we count by the imperial and general Nisan-to-Nisan accession year reckoning Artaxerxes’ reign or by the unusual Tishri-to-Tishri non-accession year system (adopted in the Book of Nehemiah). Nisan of Artaxerxes’ 7th year is, by both systems, the Nisan of 458 B.C. Now, clearly 70 prophetic “weeks” (490 years) after Nisan 458 B.C. brings us to Nisan, A.D. 33 (490 – 458 + 1 = 33), the month and year of Christ’s death and resurrection, as indicated in the Great Pyramid. One more important matter should be considered. In Daniel verse 27 we are informed that in the middle of the 70th “week,” sacrifice and oblation would cease. Christ offered Himself for sacrifice and was accepted (His baptism) half a “week” (3 1/2 years) before the end of Daniel’s 70 “weeks,” or, in other words, at the end of 69 1/2 prophetic “weeks” or 486 1/2 actual years (486 1/2 – 457 3/4 = 28 3/4 A.D. = Autumn A.D. 29. The sacrifice of Jesus, the Messiah, began when He was 30 years old and was completely consummated when He was 33 1/2 years old, thereby ending the 70th week of Daniel. 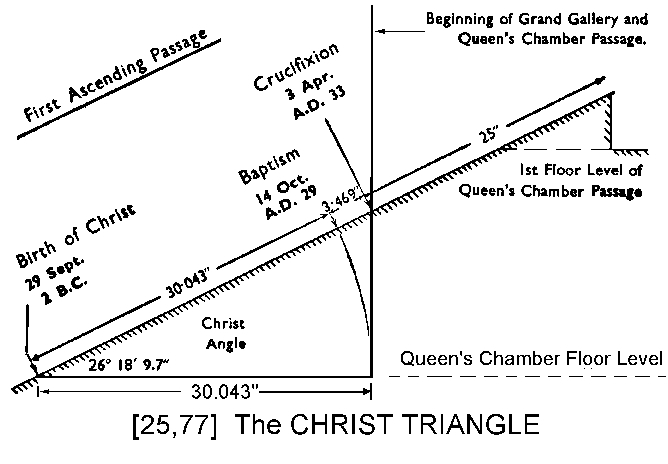 All this, revealed in the Christ Triangle, shows Bible Chronology and Pyramid Chronology to be harmonious. side, the World Trade Center would be just 4 feet 10 inches tall. the giant structure of the Great Pyramid. polished to a degree greater than your reading glasses are today. close together, you cannot see the cracks between the stones. about what was just described. made to bond the polished granite stones over 4,600 years ago. able to replicate this glue today. measurement, all his calculations began to match perfectly. decimal places. Hence, the pyramid is a square circle. Note. hundreds of years after the completion of The Great Pyramid. day is added every four years to compensate. This is untrue. of his discoveries made at The Great Pyramid. the number of days in a solar year. that distance of 365.24 in. equals the number of days in a century. total inch value at the 50th-level perimeter. curved quadrant of the Northern Hemisphere. and duration of the year. Their mission was to build a pyramid of lesser proportions on the Gizeh desert just southeast of the 3rd pyramid of king Mekaure. Their focus was not to build for size but to build for technique, following the method expounded upon by Herodotus. They were to quarry the stone out of the nearby hills, float it down the river, hire Arab workmen as haulers using ropes and pulleys to drag the blocks onto and up the ramps, putting them in place manually without the aid of levers. Upon beginning construction the Japanese found that they were faced with insurmountable problems. First an foremost, the duplicated hand tools the men were provided with could not cut the stone, so the workers had to resort to the use of air jackhammers. Secondly when the boulders were placed on the rafts another problem arose. They could not prevent the barges from capsizing, since they were soon overrun with water and could not be handled properly. They became unsafe for the men, due to the instability crated by the weight of the steamboat. Upon reaching the shore they ran into a third problem: the limestone boulders began to sink into the river silt and the sand of the desert, and those that did not sink were of no consequence for the men could not budge them. Once again modern technology was called upon in the way of trucks and land rovers to move the stone to the designated site. Finally, adding insult to injury, the great numbers of men that they had amassed, could not lift the blocks by pulley, levers, nor ropes, and as result power cranes plus helicopters were contracted to do the job. Even then, employing the use of today’s most powerful lifting machines, those blocks set in place were greatly out of alignment, and many (if not most) were broken, chipped and badly scratched, due to improper handling. Finally, the Government of Egypt interceded and put and end to their agony. The unauthorized use of the heavy land equipment had torn asunder large stretches of desert land which had become quite an eye sore. The project was terminated and the pyramid, what little was intact, was dismantled. What the world learned from this endeavor was two things-one; that the simple methods conservative scholars have for so long said were utilized were totally inadequate, falling way short of the mark-and two; even with aid of modern technology in regards to transportation, lifting, quarrying, and placing these two ton blocks the job left much to be desired. In comparison, the ingenious masonry work exhibited in the construction of the pyramids, especially the Great Pyramid, far surpassed the meager attempts made by the Japanese. When archaeologists removed one of the few remaining casing stones, (the stones that at one time covered the entire pyramid) on the north side of the pyramid at its base they were shocked at what they discovered. None of the underlying blocks examined had chipped edges, cracks, or even scratches: they were perfect! In reference to the casing stones, one of the world’s greatest Egyptologists, Flinders Petrie, found that the faces and butting surfaces of these 16 tone blocks were cut to 1/100 of an inch of mathematical perfection. 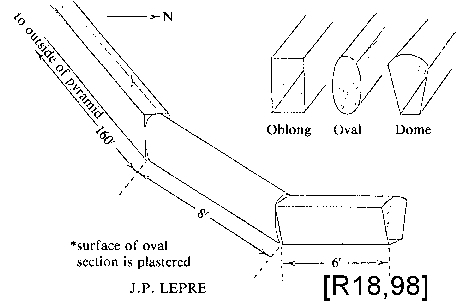 He reported, “the mean variation of the cutting of the stone from a straight line and from a true square is .01 inch in a length of 75 inches up the face, and amount of accuracy equal to most modern opticians’ straight edges of such a length. These joint with an area of some 35 square feet each, were not only worked as finely as this, but were cemented throughout. Though the stones were brought as close 1/500 of an inch, or, in fact, into contact, and the mean opening of the join was 1/50 of an inch, yet builders managed to fill the join with cement, despite the great area of it, and the weight of the stones to be moved-some 16 tons. To merely place such in stones in exact contact at the sides would be careful work, but to do so with cement in the joints seems almost impossible.” Thus the builders of these great monoliths quarried and cut approximately 80 acres of casing stone within 1/100 of an inch of perfection, and raised a man-made mountain 4000 years ago as meticulously as we cut gems. There are approximately 2,300,000 blocks of stone which comprise the Great Pyramid each weighing from 2.5 tons to 70 tons (as much as a railroad locomotive) which originally covered an area of 13.11 acres. The Great Pyramid contains more stone than all the churches, chapels an cathedrals built in England since the time of Christ. If all the stone in the pyramid were sawed into blocks one foot on a edge and these were laid end-to-end, they would stretch two-thirds of the way around the earth at the Equator. The Great Pyramid contains enough stone to construct thirty Empire State Buildings. INSANITY OR AN OPEN MIND? Using high precision GPS such as the USGS Earth Explorer and the wonders of computer technology and the Internet, it can easily be ascertained that the summit of the Great Pyramid is located at 29.9792º N, 31.1342º E. This is as close to bullseye as you can go with this state-of-the-art technology today. It has often been remarked by many pyramid researchers that if the decimal point of the latitude is shifted four digits forward it will give the number 299792 which, oddly, is exactly the speed of light in a vacuum, namely 299792 kilometers per second. Let us be very clear at this point. Even remotely considering that this is anything but a coincidence will fling out of the window everything we know –or think we know– about the human past. And yet the number is there, fixed on the ground by a six million tons structure, like some giant geodetic marker to jolt, infuriate and confuse the mind of whoever contemplates it. Firstly, this curious connection of geodesy and the speed of light expressed in the co-ordinates of the Great Pyramid requires the use of the metric as well as the sexagesimal system, not to mention the technical ability to measure the speed of light in a vacuum. There is no commonsense manner that I know that may even remotely explaining from whom or from where those who planned the Great Pyramid obtained such highly advance and sophisticated scientific information. The only possible alternative explanations are that either all knowledge is in-built in the human mind and can be retrieved by some forgotten ability or that it was imparted to the designer of this most strange and most intriguing monument. Both these alternatives are so outrageous, so completely beyond accepted logic and rationality, that the immediate reaction is to dismiss them outright as totally ‘insane’. That hold true in the world of classical science, but not so in the ‘quantum’ world that we must, like it or not, confront today. We are almost certainly not alone in this conscious universe the incredible weirdness of which is only beginning to hit us. And everything in it, living or un-living, may not be at all what it seems to be. So let us for a moment ignore logic, ignore commonsense, ignore everything we know or think we know, and take the bold step into the unknown. Let us pursue the Platonic argument further. [Note: [fn: US Geological Survey, Earth Explorer at http://earthexplorer.usgs.gov/ address ‘Great Pyramid of Giza’. See also GEOHACK using World Geodetic System 1984 (WGS84) which gives 29º 58’45.03” N, 31º 08’03.69” E, in decimal 29.979175º N, 31.134358º E. For uncertainty level for WGS84 datum see: http://www.nearby.org.uk/precision-ll.cgi… ].